In honor of equinox, raindrops balance on salmonberry canes, adorning our habitat with calm. If you google Equinox, it will tell you that the date of equal day and night is March 20th this year. It is associated with a time of balance, and of course a celebration of spring. And we can definitely appreciate all those sentiments! But in Kodiak, things feel a little different to us, perhaps less on the side of calm balance and more on the side of excited energy. We actually broke 12 hours of sun above the horizon a few days ago, on the 18th. Today the sun rises at 8:10 am and sets at 8:24 pm here and we are gaining more than five minutes of daylight a day. Add on the lingering hours of twilight in the morning and evening and it feels like we have come light years from the depths of winter. The accelerating pace of daylight gain (more than 30 minutes a week) is like the highest quality caffeine pumped directly into our nervous systems. Grinding off the mangled/rusty end of the trailer tongue. Can't wait to get the skiff in the water! It's time to get out to Uganik, and we can't help but start thinking and talking more frequently about fishing. In just a few days, weather permitting, we will be there. Now we are busy getting ready. Maintenance is a required chore in a maritime environment with salt and humidity throwing their weight around heavily. The skiff trailer, though galvanized steel, had some metal fatigue on the tongue where the receiver for the ball hitch is bolted on. 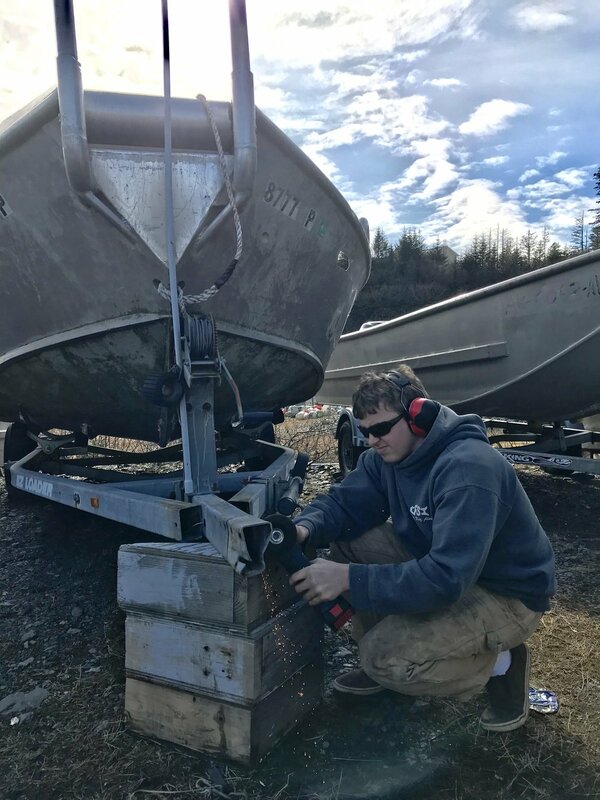 Switching out the lower unit on the outboard was a necessity due to the strains of rapid shifting in heavy weather while jockeying up to the net. And then there is the ordering of supplies to come up by barge from Seattle - greenhouse material to keep expanding our home-grown food ability, 150-pound anchors for the sets, and a bulk food order, to name a few. In town we are loading up with new web, leadline, and corkline for new nets; a new wind generator (living off the grid in winter, especially in a northern latitude with limited solar gain means harnessing free wind power); building supplies for working on our house, including sacks of special high density concrete to make our wood stove hearth safe and create a heat sink; gardening supplies; food (do we need 5 dozen eggs or 10 dozen for a month stay?) and what seem like a million specific fittings, for indoor and out. Each day we ponder projects over coffee, walk in and out of stores with multiple lists, and though crossing things off is a particular joy, somehow daily we seem to add as many things to them as we accomplish, so the lists never seem to shrink! In just a few days, weather permitting, we will be laying a frothy white wake behind us pointed 60 miles to home, away from the trappings of commerce. Our brains will begin to change frequency to a slow nature-based rhythm that takes some time to fully reboot to. Being joyfully busy with meaningful projects while attuned to Alaskan life where work is visible and deeply satisfying is what we love. All the while everything is wrapped in mother nature's embrace, suitably balanced.